Inspired by 40 years of breastmilk research our passionate team has developed Aptamil Profutura Follow On milk - our most advanced formulation yet*. Nutritionally tailored for babies aged from 6-12 months to complement a weaning diet. Our convenient ready to use 200ml bottle is ready whenever your baby needs it - day or night. There is no need for heating, cooling or mixing, just shake well, twist, pour and serve. Our Aptamil Profutura Follow On milk formulation contains our highest levels* of DHA (Omega 3 LCPs) and is enriched with iron to support normal cognitive development. We have an expert team of midwives, nutritionists and feeding advisors available 24 hours a day, 7 days a week. If you have a question get in touch on 0800 996 1000. *33% more DHA (Omega 3) than in all Aptamil Follow On milks. Important Notice: Breastfeeding is best for your baby. 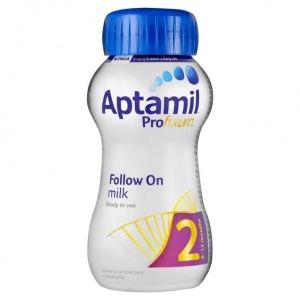 Aptamil Profutura Follow On milk should only be used as part of a mixed diet and not as a breastmilk substitute before 6 months. Use on the advice of your healthcare professional. Inspired by Early Life Science, our scientists have developed Aptamil Profutura Follow On milk. After 6 months, once weaning is established, your baby will need about 1 pint (500-600ml) per day. Failure to follow instructions may make your baby ill.
1 Wash hands and sterilise all utensils according to manufacturer's instructions. 2. Shake bottle well. Pour the required amount of milk into a sterilised feeding beaker. 3. Aptamil Profutura Follow On milk can be given at room temperature or warmed if desired. If warmed, check temperature of feed.